Are you hyped for Travis Scott?? 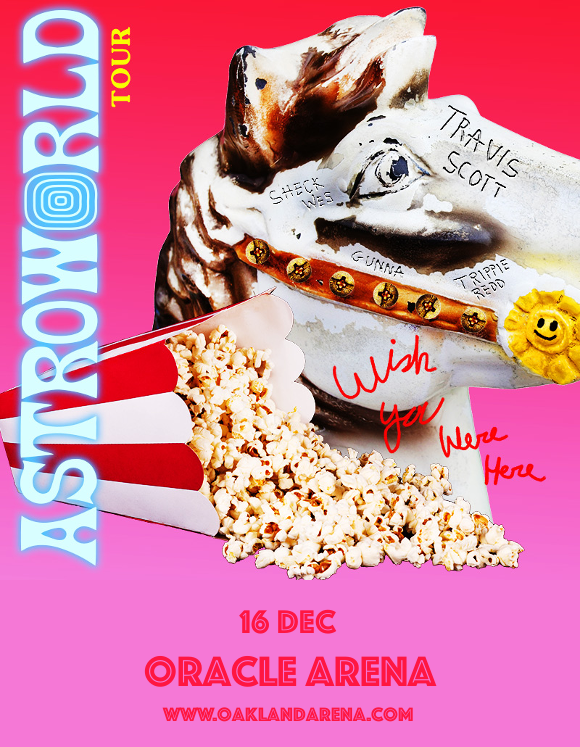 This massive hip-hop artist is coming to Oracle Arena on Sunday 16th December 2018 with the Astroworld: Wish You Were Here tour in support of his amazing third album!! Tickets are flying fast as we get closer and closer to the LIVE event – so don’t get left out!! Hit the “Buy Tickets,” button and get yours NOW while they last!! With his debut album “Rodeo,” Travis Scott topped the Billboard 100 with the hit single “Antidote,” and established himself as an unstoppable force on the trap and hip-hop scene. The new album is a star-studded one, featuring appearances from Don Toliver, Kid Cudi, Frank Ocean, Drake, The Weeknd, James Blake, Swae Lee, Gunna, Nav, 21 Savage, Quavo, Takeoff, Juice Wrld, Sheck Wes, and more!! But that’s far from all it has to offer – immediately topping the Billboard 200, the new album has been a standout hit with both fans and critics, with Pitchfork stating that Scott’s "skill as a curator helps sculpt a sticky, humid, psychedelic world with dazzling production and odd pleasures at every turn”. Now, get ready to experience that world in person. Get your tickets to see Travis Scott at the Oracle Arena TODAY! !